In what ought to grab the attention of officials in both Thailand and Laos (and serve as an early warning to India), HPAI H5N6 has been detected in poultry products sold in markets in east-central Myanmar, along its border with China (see map above). During its first two and a half years of circulation, H5N6 has only been reported in China, Vietnam, and Laos. In November it turned up first in South Korea, followed quickly by Japan. Just yesterday we learned it had been detected in Taiwan. Risk-based surveillance of H7N9 in targeted border Townships and live bird market in Yangon and Mandalay has been conducted since 2013 by cooperation between the Livestock Breeding and Veterinary Department and FAO. Until now, the 5th round of the risk based surveillance of H7N9 has been conducted and 16545 chickens and ducks oropharyngeal swabs, 7765 environmental swabs and 705 duck sera were collected from poultry collecting points, poultry processing sites, formal city markets and live bird markets. Those samples were tested in Mandalay and Yangon Diagnostic Laboratory and then confirmed and sequenced by the Australian Animal Health Laboratory, Geelong. From this 5th round of active surveillance, clade 2.3.4.4 H5N6 HPAI virus, which shares 99% similarity with A/chicken/Hubei/XG18/2015(H5N6) and 98% similarity with A/duck/Guangdong/GD01/2014(H5N6), was detected in the samples collected from chicken and environmental swabs in Monglar, which has a common border with China. H5N6 positive samples were taken from apparently healthy chickens imported from China, as well as from the environment. 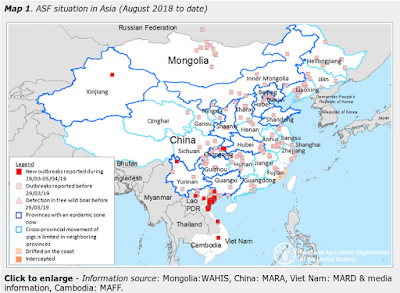 H5N6 positive samples were more concentrated geographically and temporally, and were found specifically in live bird markets, in ducks and chickens imported from China (unknown breeds). The samples were collected almost a year ago in March of 2016. So while the report is appreciated as it informs the history and evolution of the clade 2.3.4.4 viruses, this report does not contribute to current situational awareness. As noted by the commenter, these samples were collected in early 2016, confirmed in December, and only just now publicly announced. Another example of the dificulty of getting anything resembling real-time surveillance from some parts of the world.